Contains one xml (Greyhawk Wars) with 10 factions, 3 alliances, and a built in free-for-all option. Greyhawk Wars is an immersive strategy game based on the World of Greyhawk, the classic setting of Dungeons & Dragons. 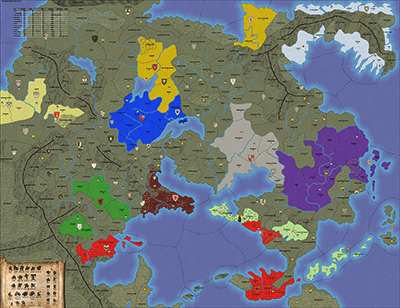 Inspired by an out-of-print tabletop wargame and built on the TripleA engine, Greyhawk Wars offers world-spanning conflict, diverse factions, and flexible opportunities for conquest and diplomacy. Central to the game are the individual personalities who lead each faction, recruiting mercenaries and seeking magical artifacts to tilt the balance of power in their favor.